I'm trying out the SharePoint Framework and am following the setup instructions. I've downloaded and uploaded to my site workbench.aspx. 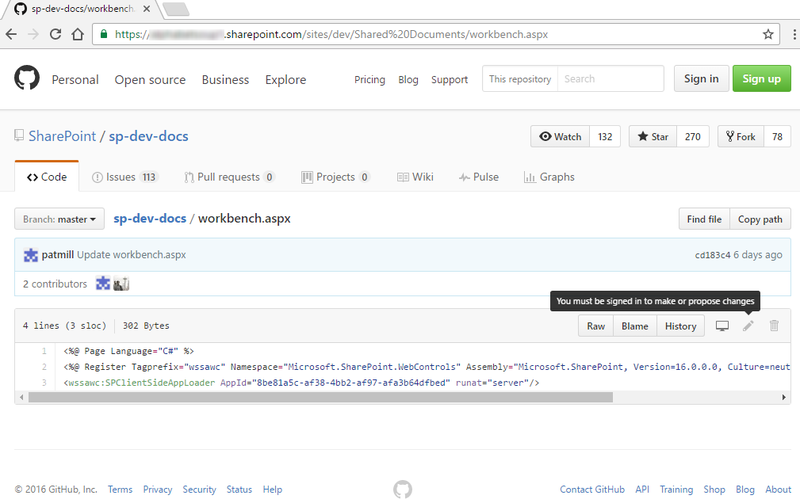 When I go to "preview the web part in SharePoint" and load the workbench all I see is a what appears to be a GitHub page (but all the links are broken as they attempt to load from my Office365 instance). Not quite sure what I'm doing wrong. Below is a screen shot of what I see. All the links are broken as they're relative to the root of GitHub and so it's trying to find them in my Office365 SharePoint instance. Any ideas? you need to download that file...follow below steps. Download zip folder, extract on your local folder, upload this workbench.aspx to document library. Also do make sure you have created ClientSideApplicationId in your document library. thx Jeff for reporting this and apologies on the misleading guidance, which was clearly wrong. We have now updated the page with correct links and additional details. That's the aspx page you want to upload. It should be 3 lines of code.